PRICELE$$: How much does it cost to run for a U.S. Senate seat? One million? Two? our?! Only if you want to lose. It costs considerably more if you want to stand before the crowd, fingers held in a 'V' high above your head. The cost of running for office has grown so large that only a tiny sliver of Americans can donate anything significant, let alone run themselves. Politicians must go to large donors such as the oil & gas industry, agrichemical companies, health insurers, and Wall Street...you know...the type of companies they're supposed to be regulating. Likened by one seasoned Senator to the ancient art of whoring, America's electoral system forces elected representatives, in both parties, to rely on special interests for their job security. 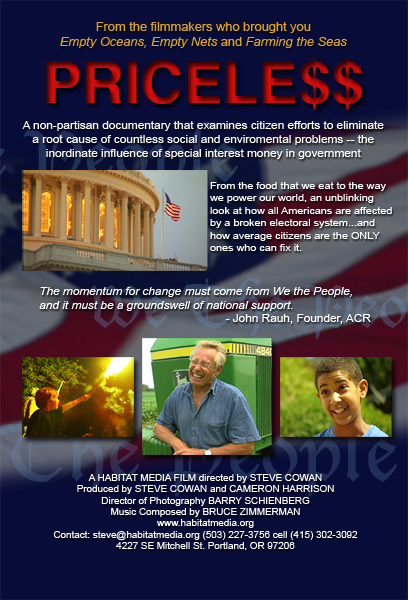 PRICELE$$ is a one-hour documentary journey from 4th of July revelry to America's croplands; from hopeful windfarms to our nation's capitol in search of some answers. Maybe even a solution. The colorful cast of characters will inform, move, and amuse you. You'll be privy to personal accounts of lives upended and hear how postal rates cause global warming. You'll learn the definition of "running clean" and discover the fate of two politicians who actually enjoyed fundraising. Even the third graders in our film know something has to change. And a citizen movement is afoot to mandate a new electoral system, road-tested in Arizona and Maine. With all the challenges facing our nation today, now is the time for answers. Democracy, after all, is priceless. Habitat Media has produced several award-winning documentaries including primetime PBS Specials like Empty Oceans Empty Nets and Farming the Seas; films that communicate the importance of citizen participation and show viewers exactly what they can do to help solve a seemingly overwhelming problem. Our films have screened before U.S. Congressional Committees, the United Nations, White House staff, and in federal judges' chambers. Short versions are ongoing exhibits at marine aquaria and natural history museums. They are also educational resources used by hundreds of high schools and colleges. Your support is needed! Habitat Media is a 501(c)(3) non-profit production group. We still seek funding to complete the fine-cut of PRICELE$$. Post-production costs include the licensing of archival footage, selected music and finalized computer graphics and animation. Preview for PRICELE$$ from Cameron Harrison on Vimeo. Copyright Â© 2009 Habitat Media.